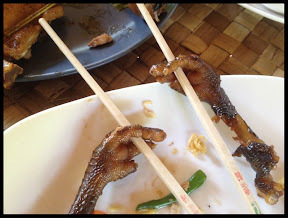 When you order chicken in Cambodia, you get all the chicken including the damn feet. We had lunch today in a hut overlooking a muddy river. I always take the safest route and I ordered noodles which are usually fail-safe. Eddie ordered roasted chicken so he shouldn't have been surprised when the amputated appendages arrived. They are apparently quite delicious but I wouldn't know--I'm just not that adventurous. Of course I'm not going to miss out on a good photo-op! 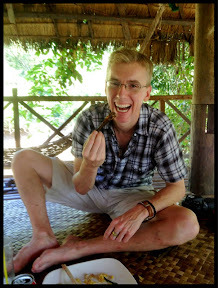 I also refuse to eat tarantulas and other assorted insects which are also eaten in this country. Eating pizza on pubstreet is sometimes as risky as I want to get.